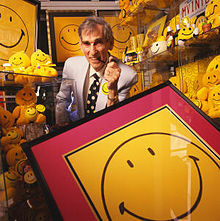 50 years ago, Harvey Ball designed the iconic Smiley Face. Its aim was to ease the acrimony following a merger of two insurance companies. The graphic supported a friendship campaign to get employees to smile when they either answered the phone, paid a claim or wrote a report. It took him 10 minutes supposedly and handed the work over for the princely sum of $45. Not bad return for a 10 minute piece of work in those days? Neither Ball nor the insurance company registered the design which was subsequently picked up by Bernard and Murray Spain. In 1970 they added the words “Have a Nice Day” to the Smiley face, copyrighted the image and the words and for 18 months they milked the fad. Some 30 years later they sold their resulting business for $307 million. Not bad huh? Just goes to show the value of a smile – so what about firms that use a smile in their logo? Smile Bank – owned by the cooperative Bank. Now struggling to smile following the demise of the CEO. There has to be congruence with the message, the values and the governance don’t you think? Amazon’s new design incorporates a smile which points out that there is everything in store from A-Z. Does the smile make you feel better about Amazon than the previous logo? Argos has turned its previous upward swoosh into a definite smile. I think I like Tui’s the best. 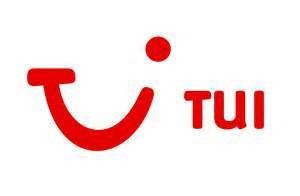 When you say Tui, the long E vowel at the end makes you smile. A subject for another blog maybe? PS. Harvey Ball went on to found World Smile Day. (Note: that design is registered!!) It raises money for the Harvey Ball World Smile Foundation, a non-profit charitable trust that supports children’s causes. World Smile Day is held on the first Friday of October each year to “Do an act of kindness – help one person smile.” I think I like that even better?